It seems like every anti-aging cream and advanced acne treatment has a “magical elixir” that really works, at least according to their commercials. Bold advertising claims have long since been an issue of debate, and some of these companies were called out publicly for being misleading. With false advertising claims like these, it can be difficult to know what’s right and what’s wrong. In light of some of the cosmetic fallacies floating around out there, let’s take a look at five common myths about skincare and acne. Myth 1: Anti-aging products can permanently remove wrinkles. Nope, sorry. This is generally just advertising hype. Most anti-aging products and special wrinkle creams just moisturize the skin so it looks healthier, but they don’t actually get rid of fine lines. If you’re trying to remove wrinkles, topical retinoids such as “Retinol” or “Tretinoin” can be somewhat effective, and they can be purchased at over-the-counter drug stores. Myth 2: You should always pop a pimple to drain the pus. Popping pimples with your hands can cause bleeding and scarring, so you’re better off leaving them alone. 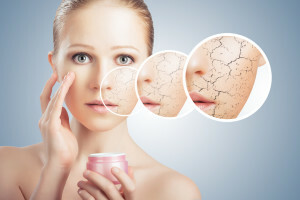 In fact, most dermatologists recommend that you keep your hands away from your face because the dirt and oils in your fingers can cause more breakouts. But if you can’t resist squeezing those hideous whiteheads, you can purchase an inexpensive tool called a “comdone extractor,” which can safely excrete the pus from a pimple without making things worse for your skin. Myth 3: You’ll outgrow acne when you’re older. This isn’t necessarily true for everybody, unfortunately. Acne fluctuates based on hormone levels, so you could still get breakouts even at age 50. Women, for example, are especially prone to acne during menopause when their hormones are changing. Men, on the other hand, can “outgrow” acne after puberty when their hormones have a chance to balance out, but this can vary by person. Myth 4: Sunscreen is only necessary when it’s sunny. Ultraviolet radiation from the sun can still cause sunburns even when it’s overcast and cloudy. Therefore, you should always wear sunscreen if you’re going to be outside, especially when your bare skin is exposed. And don’t rely on makeup with SPF (Sun Protection Factor) in place of sunscreen. Instead, use sunscreen in addition to your makeup. Myth 5: You can keep your face acne-free by scrubbing with soap. Two things are wrong with this statement. First, you shouldn’t scrub your face—it won’t be cleaner if you do this, plus it can lead to rashes and burns. Instead, gently massage the cleaner into your face for about 20 seconds, and then thoroughly rinse with warm water. Secondly, soap is not the best cleanser for your face because it’s harsh on skin, and it won’t get rid of acne. Additionally, you should also avoid products that contain sodium lauryl sulfate or alcohol because these ingredients actually remove moisture in your skin, making it more prone to dryness and irritation. Every facial cleanser is different, so be sure to talk to your dermatologist to find a product that works best for you.